It was late August. My wife Linda and I and our three kids were on vacation in Colorado. We were in Crested Butte for the day, a small, former mining town in the Rocky Mountains that is as rugged and beautiful as I am not. These days, and despite its frontier beginnings, the town is overflowing with fun restaurants, cool stores and funky bars. Linda and two of our kids were off walking around. I was sitting on a bench with my oldest son, Evan, just enjoying the sunshine and watching the people pass by. That’s when we saw it approaching … the Google Street View car. 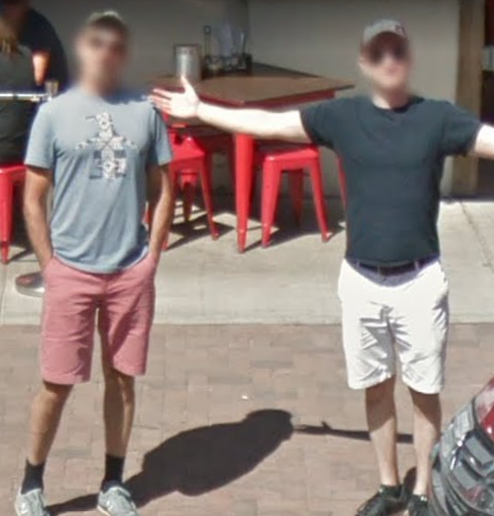 You know, the car with the big omnidirectional camera on the roof that drives all over the place taking street level photos that are then used within Google maps. We looked at each other, ran to the edge of the curb, and smiled for the camera (I’m the one with the all too appropriate penguin shirt). That was August. Two weeks ago (I had been checking regularly), the town of Crested Butte was finally updated in Google maps. And there we were, just as we had hoped. So here’s my question for you: Is getting my picture taken on Google maps a marketing strategy for my business? After all, I am clearly visible, in a penguin-themed t-shirt, on the worldwide platform of one of the most well known brands on the planet. And I’ll be there for a few years, at least. And it cost me nothing. I hope you said no. In terms of bringing me new clients, this tactic is a big fat zero. There’s a certain marketing myth floating around that is embraced by many professionals: The big hit, will make the big difference. If I can get interviewed on the right podcast. If I can write a guest post for the right blog. If I can launch the new web site, speak at the right event, or get quoted in the right publication. If I can do any of that, the doors will open and the leads, prospects and clients will rush in. It’s an oddly compelling fantasy, but effective marketing doesn’t work that way. Even publishing a book – something I recommend professionals do for all kinds of reasons – is not, by itself, going to make your phone ring for very long (if at all). It keeps you in front of the people you already know. Don’t worry about attracting strangers until you’ve found a way to stay visible with the people who are already predisposed to trusting and listening to you. It repeats. Getting quoted in the Wall Street Journal is nice. But tomorrow, somebody else will be quoted. Use tactics that happen over and over again. It demonstrates what you know. Social media is a useful add-on to your marketing. But the format tends to be very brief. You need enough running room to share something of value, so potential clients and others begin to believe that you know what you’re talking about. It reveals your authentic personality. Every professional you compete with is just as capable, educated, experienced and credentialed as you are. Your chances of standing out based on any of that are slim – to the rest of us, you and your legal, financial, consulting, writing, medical, or whatever-it-is-you-do peers, all look the same. We can’t tell who’s better – but we can tell who we like. That’s why personal stories, conversational language, and flightless aquatic bird-themed company names help you stand out. In short, and at the risk of being told to, “Go back to 2007, Grandpa,” you need an email newsletter. It’s the only tool I’ve ever seen that satisfies all four of these things. But isn’t email dead? No. It’s crowded. And that’s not at all the same thing. It’s also essential to you and every person you know. Twitter, LinkedIn, Facebook, Instagram, Networking, Snail Mail, Telephone, Texting, or Email. Without email, everything stops. Don’t you think you should be in that mix? Here’s the bottom line. I’ve been waiting for more than 10 years for a marketing tool to come along that’s more effective than a regularly published, well written, useful and engaging email newsletter. I’m still waiting. So if you’re doing it, keep going. If you fell off the wagon sometime in the past, hop back on. And if you’re still thinking about it, you might want to go stand out on the curb, just in case the Google car drives by. What have you been waiting on for more than 10 years? How many miles a day do you think the Google car driver drives? I do emails because of you! Saw your article in aninsurance magazine about two years ago. Thanks for the great work. Connect with me at carlin@elevatingvalue on twitter. Excellent! Glad you are publishing. 1. I hear he never shows up. 3. I know you do! Are you sure that’s a penguin, Michael? Sort of a Colorado-style penguin? Yes, kind of a new age penguin silhouette! 1. I hope the wait is soon over. 3. Happy 10 year anniversary! This is one of the best you’ve done yet — I’m saving it as a reminder to keep focusing on the people who know & like me. Last week I tried emailing some strangers (who aren’t on my monthly enewsletter list) about my services and got no results…I need to stick with what works! I don’t even hear back from my children; I’m sure emailing strangers would not work. Glad today’s post hit the spot! I am working on getting my own newsletter up and running right now. How long is reasonable to be able to get a newsletter up and running for a client?? From the initial contact to completing? Can it be done in a month?? I would hate to quote a client a month time frame and then not be able to deliver 🙁 Your newsletters are fantastic and have helped me learn so much. Hi Elizabeth. I think a month is way too ambitious, especially if you are somewhat new to this. I spend a month just talking through voice, audience, positioning, topics, competitive advantage and things like that. That’s before we write a single word or design anything (design always takes a lot of back and forth). Plus, given how many decisions there are to be made, you don’t want to rush your client through it or you’ll end up having to redo things as they understandably change their mind on things. I always say three months, two if they are willing to move quickly. 1) To lose those last 10 pounds. Again. 1. The last 10 are the hardest. 3. You’ll be pleased to know that I just googled, “Britain-centric dog-friendly historical travel stories with cheeky twist” and, among the 780,000 results, you came up first. The power of the niche! I’m a believer in email newsletters for the reason why I’m writing to you days after your email arrived in my inbox: email lingers and is easily retrievable. It’s not ephemeral like a tweet, a text, or FB message or post on a busy timeline. However, all of those other communication media are causing lots of noise in our recipients’ lives. People are bombarded and overwhelmed by the amount of digital communication, which is a challenge for email marketing. The biggest challenge I’ve noticed for email newsletters, though, is the Gmail effect. In recent years, the vast majority of people signing up for my most active newsletter have Gmail addresses. And Gmail sorts our Mailchimp newsletter right into the promotional bin. A bin that very few people look at, and whose contents are tossed unread. Over time, this has really hurt our “open and click” rate, to the point where sometimes we wonder about all the trouble we go to for dwindling results. We missed the boat, when Google launched their email tabs back in 2013, of telling subscribers to “move” our newsletter into the primary tab and/or add us to their contact list (which would deliver it to primary). I’ve placed that message on our “thank you for subscribing” email, but can’t expect people new to our newsletter to take the pains to do that. So, I still believe emails are the best method of communication with subscribers, but there are always new “challenges.” I’ll keep looking to your entertaining and useful emails for tips and advice. I agree, it’s definitely harder today with things like tabs or certainly in the early days, when there were way fewer options for potential subscribers to choose from. On the flip side, 10 years ago email was chained to your laptop computer and before that to a desktop that never moved. Now people car read in bed, while waiting for the train or whatever, so there are some things working in our favor as publishers too. Bottom line, I think, if it’s good stuff people seek it out; if it’s garbage or too self-promotional, they delete it anyway. Keep publishing and thanks for taking the time to comment! This is a great story! I love that you and your son can communicate wordlessly! 1. I’ve been waiting my whole adult life in the grocery check out line. No more since I started using Instacart grocery delivery service. Life altering. Sorry, you and Evan are not pictured. Next time get naked, and you might be. On second thought…..
1. I need to hear more about this (although i suspect I live outside the range of delivery!). 2. I can’t remember the last time someone asked me to get naked. Actually, I do. It was approximately never. So thank you. 3. And I read every issue! 3. Yes! Twice a month on how to communicate more powerfully in all types of business settings. Thanks to working with you. There are frustrations and overall it’s an enjoyable process and love when people respond with their own stories. 1. I have the reverse issue. Since the couches are new, we are waiting on a new dog. 3. I read every issue. 1. A worthy goal. Maybe we should just have the next one in Spain and I can deduct the trip?! 3. Send me a link to check it out! 1. A housecleaning service that comes packaged in a buff 29-40 yr old man with a great sense of humor. 3. Yes, two different ones to two different audiences. One for clients and prospects and another for people who want to do what I do. The latter is far more successful than the former. Wondering if the “Giant Penguin in the Sky” is giving me a message….????? 1. I don’t clean houses and I’m well north of 40, but I appreciate your asking. 3. I wonder too. How do you define successful in this case? I seem to recall your world was pretty well rocking before we met, but you are welcome! I never miss an issue of Fontenot’s (and I’ve learned a ton about healthcare). I still design paper newsletters oh and I spent time in the butte in the 90s. We flew into gunnison in a small and I mean small plane. Mountains right at the edge of the road. Never saw that. Looking forward to reading that novel. And let me just say, I think the word “duff” should be used more often in spoken language. Kind of conjures up the old west in a charming way.